BigFold Z premium towels with decorative emboss that shouts quality, hand-performance, and hand comfort fit into existing C-Fold and multifold dispensers (with no adapter required) to provide a premium, cost-saving C-Fold substitute. This towel’s unique fold allows for reliable, touchless dispensing of one fully-opened, absorbent towel, which reduces the number of towels used as well as the risk of cross-contamination. 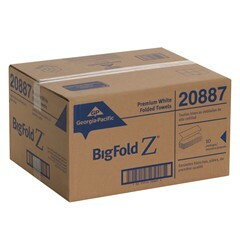 BigFold Z outperforms C-Fold towels by reducing waste and decreasing costs for an economical solution you can count on. High quality emboss and guaranteed satisfaction* for your customers, employees and you!